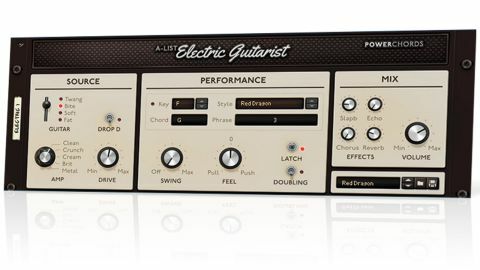 As an authentic, stylistically expansive library of ready-to-rock rhythm guitar loops in a fun and intuitive performance interface, EGPC is a welcome addition to the A-List roster. Just be aware that it's very 'preset' by nature. Authentic and expansive library. Fun and intuitive. Not for those that want detailed control. Propellerhead's ongoing recruitment drive for 'live' (as opposed to electronic) musicians continues with the second instrument in their A-List series of Rack Extensions. Electric Guitarist Power Chords is an 'auto-playing' electric guitar ROMpler (715MB) designed to make adding rhythm guitar parts to your Reason projects effortless. The guitar sound is defined in the Source panel, which offers four pickup-based variations (Twang, Bite, Soft and Fat), four optional amp types (Crunch, Cream, Brit and Metal), a Drive control and a switch for Drop D tuning. Although EQ controls wouldn't go amiss, there's enough here to enable a decent range of core tones. "Impressive-sounding rhythm guitar tracks come together as fluidly and easily as advertised"
Onto the rhythms, then, which are arranged in banks and selected by MIDI note input. Notes C4 to C9 trigger their corresponding power chords, while key combinations can be used to play six variations - sus4, augmented, +5, etc. 46 genre-specific Styles (largely rock-orientated but straying into funk, reggae and pop territory, too) are each subdivided into 11 Phrases of increasing complexity, selected using notes C3 to B 4, while C1 to B 3 switch between 23 standard Phrases common to all Styles. You can control the strength of palm muting using the mod wheel, dial in humanisation and swing, and activate a double-tracking mode. By combining chords and Phrases, either live or through MIDI sequencing, impressive-sounding (albeit only power chord-based) rhythm guitar tracks come together as fluidly and easily as advertised. Four effects (Slapback and Echo delays, Chorus and Reverb) are then on-hand in the Mix section. In order to keep things simple, EGPC gives you no front panel control at all over the notes within the Phrases, although you can feed into the CV Note input (from the Matrix Pattern Sequencer, say) to trigger their component slices individually. This opens the instrument up to more adventurous producers, breaking it out of its otherwise realistic, rather conservative niche and into the wider world of rhythm design.